Sports technology has been significantly adopted in outdoor sports activities such as cricket, football, soccer, rugby, etc. The games are contributing significantly in terms of revenue to the sports technology market. Moreover, indoor sports activities are also contributing prominently to the market due to an increase in the adoption of sports technology in games such as badminton, chess, swimming, etc. Currently, the adoption of sports technology is lower in indood sports compared to outdoor sports. However, it is expected to increase in the near future. A rise in the adoption of wearable devices by athletes across regions is expected to drive the sport technology market. The clubs segment is expected to account for a significant share of the sport technology market over the forecast period. 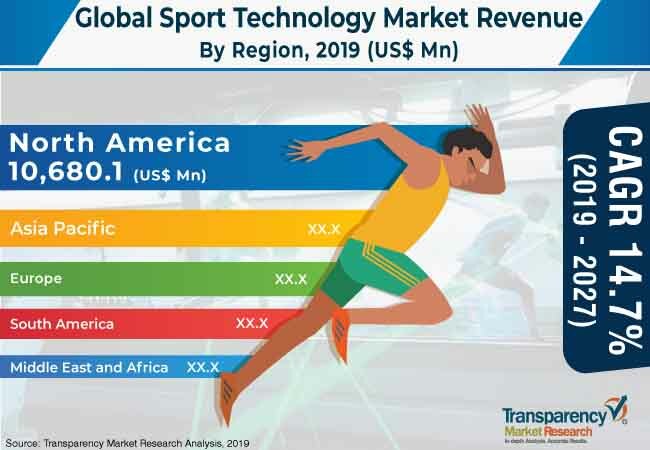 The global sport technology market was valued at US$ 27,589.5 Mn in 2018. It is expected to expand at a CAGR of 14.7% during the forecast period. The adoption of Internet of Things (IoT) in the sports industry plays a major role in the development of players, player and fan safety, and fan engagement. IoT provides a platform to fans, coaches, physiotherapists, and players to analyze the collected data from various devices. Users can share game strategy and players’ injury status. The platform provides enhanced customer experience. Additionally, the integration of Artificial Intelligence (AI)-enabled solutions in the sports industry helps bring automation and data analysis for business decisions, ticket sales, sponsorship activations, athlete training, and performance evaluation, thereby accelerating the sports technology market. Further, the integration of virtual and augmented reality in sports plays a key role in constantly engaging fans by providing them the opportunity to get closer to athletes. In the 2018 session, all 33 games of the FIFA World Cup were broadcasted on BBC sports through a virtual reality (VR) app. Thus, an increase in the adoption of advanced technology in sports media is expected to drive the sport technology market. However, a rise in cybersecurity concerns is one of the major restraining factors hampering the global sports technology market. Nevertheless, a rise in demand for various advanced technologies such as analytics solutions, wearable devices, etc. for team management, athlete performance, and team performance due to an increase in competition is anticipated to offer growth opportunities to the global sport technology market. The sports technology market in Asia Pacific is driven by the sale of hardware and software and increase in investment in sports across countries such as China and India. These economies have been more active in sports such as cricket, basketball, baseball, etc. Additionally, the e-sports industry in Asia Pacific is projected to expand substantially. Factors such as high bandwidth, and the advent of HD and 3D TV are projected to drive the market in countries of Asia. The market in Asia Pacific is estimated to expand at a rapid CAGR of 19.9% from 2019 to 2027. The sports technology market in Europe is estimated to expand at a high growth rate , mainly due to the use of advanced technology across different sports in European countries. New business models in sports are projected to emerge due to the rise of blockchain technology and Artificial Intelligence in Europe. The economies of European countries are developing at a rapid pace, giving rise to a steadily increasing number of start-ups and creating growing momentum. Additionally, European investors are still more traditional, low risk takers, and demanding. Therefore, there is need for better connectivity between the sports world, investment world, and tech world. These factors are expected to fuel the growth of the sport technology market. Major players operating in the sport technology market include Accenture Plc, Catapult Group International Ltd, Chetu Inc., Firstbeat Technologies Ltd, IBM Corporation, Kinexon Precision Technologies GmbH, Krossover Intelligence Inc., Opta Sports, Oracle Corporation, Orreco Limited, SAP SE, SAS Institute Inc, SportRadar, STATS LLC, and Tableau Software Inc. The sports technology market report provides analysis for the period 2016 to 2026, wherein the period from 2018 to 2026 is the forecast period and 2017 is the base year. The report covers all the major trends and technologies playing an influential role in the market’s growth over the forecast period. It also highlights the drivers, restraints, and opportunities for the analysis of market growth during the said period. The study provides a complete perspective on the evolution of the global sports technology market throughout the above mentioned forecast period in terms of revenue (US$ Mn). The market overview section of the report demonstrates market dynamics such as drivers, restraints, and opportunities that influence the current nature and future status of this market, regulations and policies, ecosystem analysis, PESTEL analysis and Porter’s five force analysis. Further, key trend analysis included in the report highlights technological developments and their impact considerations. Adoption analysis of sports technology has been provided to offer a thorough understanding of the overall scenario in the sports technology market. The report also provides an overview of various strategies adopted by key players in the market. The report segments the market based on component, sports, application, end-user, and geography. In terms of component, the market has been classified into software, wearable devices & sports equipment, and services. The software segment has been sub-segmented into on-premise and cloud. The services segment has been further bifurcated into training & implementation, support & maintenance, managed/outsourced services. Based on application, the market has been categorized into active and passive sports. Further, the active sports segment has been sub-segmented into tracking and decision making. The passive sports segment has been further divided into analytics and statistics, tactics and simulation, training, game performance analysis, team analysis & management, injury, and health analysis. In terms of sport, the market has been classified into baseball, basketball, cricket, cycling, football, golf, rugby, and others (swimming, badminton, tennis, and athletics). Based on end-user, the sports technology market has been classified into coaches, clubs, leagues, sports associations, and others (athletes & sports person). In terms of geography, the market has been segmented into Asia Pacific, Europe, North America, South America, and Middle East & Africa. The report provides in-depth segment analysis of the global sports technology market, thereby providing valuable insights at the macro as well as micro levels. Additionally, the report highlights competitive scenario and trends in the sports technology market such as concentration rates, mergers & acquisitions, and expansions undertaken by companies. The report also highlights the competitive landscape of the global sports technology market, positioning all major players according to their presence in different regions of the world and recent key developments initiated by them in the market. The comprehensive sports technology market estimates are a result of our in-depth secondary research, primary interviews, and in-house expert panel reviews. These market estimates have been analyzed by taking into account the impact of different political, social, economic, and technological factors along with the current market dynamics affecting the sports technology market growth. The report provides all the essential information required to understand the key developments in the sports technology market and growth trends of each segment and region. It includes basic overview, revenue, and strategy and developments under the company profile section. Also, the report provides insights related to trends and their impact on the market. Furthermore, Porter’s five forces analysis explains the five forces, namely buyer’s bargaining power, supplier’s bargaining power, threat of new entrants, threat of substitutes, and degree of competition in the sports technology market. The research methodology is a perfect combination of primary research, secondary research, and expert panel reviews. Secondary research sources such as annual reports, company websites, financial reports, SEC filings and investor presentations, national government documents, internal and external proprietary databases, statistical databases, relevant patent and regulatory databases, market reports, government publications, statistical databases, World Bank database, construction projects by region & end use industry, and industry white papers have been referred. Primary research involves telephonic interviews, e-mail interactions, and face-to-face interviews for detailed and unbiased reviews on the sports technology market across geographies. Primary interviews are usually conducted on an ongoing basis with industry experts and participants in order to get the latest market insights and validate the existing data and analysis. Primary interviews offer first-hand information on important factors such as market trends, market size, competitive landscape, growth trends, outlook, etc.. These factors help validate and strengthen secondary research findings and also help develop the analysis team’s expertise and market understanding. Moreover, the data collected and analyzed from secondary and primary research is again discussed and examined by our expert panel. The research study includes profiles of leading companies operating in the global sports technology market. Some of the key players profiled in the report include Accenture, Catapult Group International Ltd, Chetu Inc., Firstbeat Technologies Ltd, IBM Corporation, Kinexon Precision Technologies Gmb Krossover Intelligence Inc, Opta, Oracle Corporation, Orreco, SAP SESAS Institute Inc, SportRadar, Stats LLC, and Tableau Software Inc.